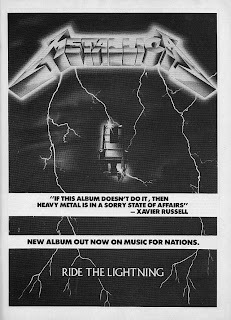 None But My Own: 'Ride The Lightning' turns 25! 'Ride The Lightning' which was released on July 27, 1984 is my favorite Metallica album. It was the first one I bought as a "new release" (in 1985), it will forever be "my" album. I also love 'Kill 'Em All', for all it's youthful rage attitude and piss 'n vinegar stance it's aged incredibly well. OK, yeah, "Jump In The Fire" remains a bit cheddary, but the rest is indeed like a fine wine. 'Master of Puppets' is of course, incredible. Depending on the day and my mood it can be the ultimate Thrash album, ever. I'll always say 'Reign In Blood' and 'Master' are the first words in Thrash Metal perfection. 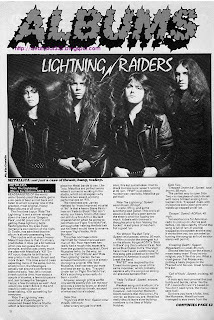 'Ride The Lightning' will always be 'Master's' big brother. The one that showed him being melodic without sacrificing any of the heaviness is OK. It also showed him how to sequence an album...Classical intro-fast song, title track, bring the heavy and then the "ballad" which takes care of side 1. Side 2's would be similar as well. But most of all, 'Ride' was the ultimate blend of speed, heavy, melodic, progressive and groundbreaking. Two blogging friends reminded me of 'Ride's' 25th birthday, which can be read here and here. I'd put this record up against anything released in the past 20 years. Even Phil Anselmo when asked about (the possibility of) supporting Metallica back in 1992/3, would they (Pantera) be able to hold their own. Anselmo said, "I don't know, but the second they rip into "Creeping Death" it'd be over."